A number of well recognised brands have disappeared over the last few years such as Blockbuster, Woolworths, Compaq, Republic and Jessops – all recognised brands who at one stage were market leaders. So what’s the common thread of these well-established traditional retailers not managing to re-invent themselves as a digital brand? “Dont find customers for your products, find products for your customers” – putting the customer at the centre of the conversation by interacting, engaging and using their feedback to steer new opportunities to satisfy and delight users (e.g. Threadless, Apple, 37Signals). The removal of the “us v them” mentality and building one to one communication with their customers through the use of social media. Moving traditional companies to embrace the digital age requires a cultural shift within an organisation and what your brand stands for to a digital audience. Where brand loyalty was once a successful ingredient towards brand survival, this has been replaced by an impatient digital audience expecting to be delighted by brands that create remarkable products and services and they frankly don’t care if the brand is well establised or not. 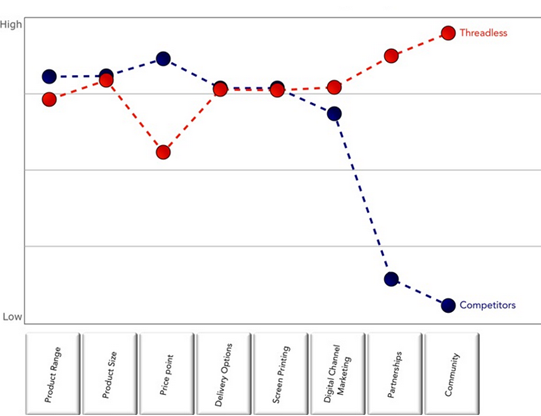 Brands need to consider embracing the Blue Ocean strategy which is defined as creating an untapped market place. Created by W. Chan. Kim and Renee Mauborgne, Blue Ocean Strategy suggests an organisation should look to create a new demand in an uncontested market space. 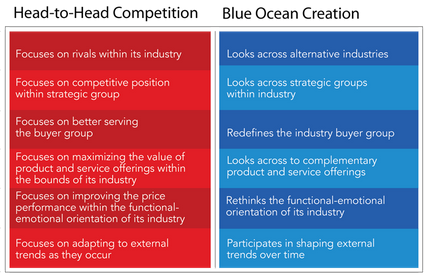 The opposite to the Blue Ocean is the Red Ocean, which is where the existing competition is fighting it out for market share with one another as explained below. By creating an uncontested market space, a Blue Ocean provides you with the opportunity to create a new demand for your product or service from an untapped customer base and at the same time delight your existing customers. To put this into context, here are two brands that have successfully introduced this strategy, Starbucks and Threadless. 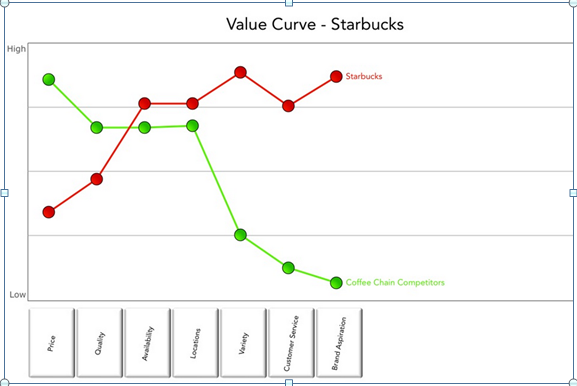 Example 1: Starbucks – The largest coffee house in the world, was operating in a highly competitive market place and needed to re-define its proposition to its consumer base. By turning the idea of having a cup of coffee into a “way of life” by redefining how customers can enjoy a Starbucks experience through the coffee shop environment, introducing music and wi-fi in a relaxed setting the company established a new market space which other coffee chains ignored (or are now trying to replicate). Brand Aspiration – Accelerated Starbucks to become a global brand that created an aspirational brand which customers wanted to experience and became a “day-out” experience in meeting friends. The designer who has their work printed onto T-shirts then receives a cash reward – thereby incentivising the artist wiht the brand. It’s a perfect example of the famous phrase: “Dont find customers for your products, find products for your customers” . Ok, to do this does require a cultural shift, perhaps a change in focus and a willingness to re-appraise how your business interacts with customers (e.g. are they at the centre of your planning and are you listening to them?) Digital is re-writing how business is done, who succeeds and who doesn’t and how agile an organisation is in the face of new entrants to a market. It sounds to me by creating an uncontested market place, where your business can define and own seems a logical step to make.